Effects of Competence, Exposure, and Linguistic Backgrounds on Accurate Production & Perception of English Pure Vowels by Native Japanese and Mandarin. 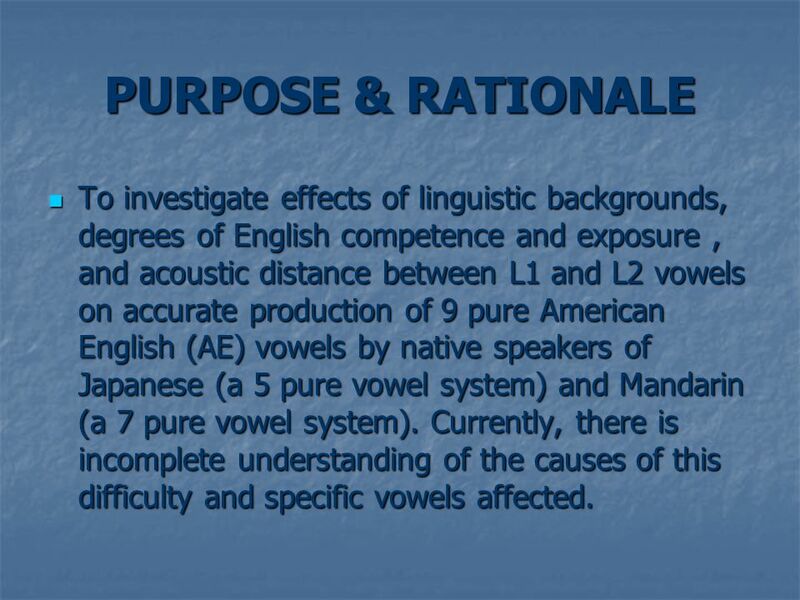 2 PURPOSE & RATIONALE To investigate effects of linguistic backgrounds, degrees of English competence and exposure, and acoustic distance between L1 and L2 vowels on accurate production of 9 pure American English (AE) vowels by native speakers of Japanese (a 5 pure vowel system) and Mandarin (a 7 pure vowel system). Currently, there is incomplete understanding of the causes of this difficulty and specific vowels affected. To investigate effects of linguistic backgrounds, degrees of English competence and exposure, and acoustic distance between L1 and L2 vowels on accurate production of 9 pure American English (AE) vowels by native speakers of Japanese (a 5 pure vowel system) and Mandarin (a 7 pure vowel system). Currently, there is incomplete understanding of the causes of this difficulty and specific vowels affected. 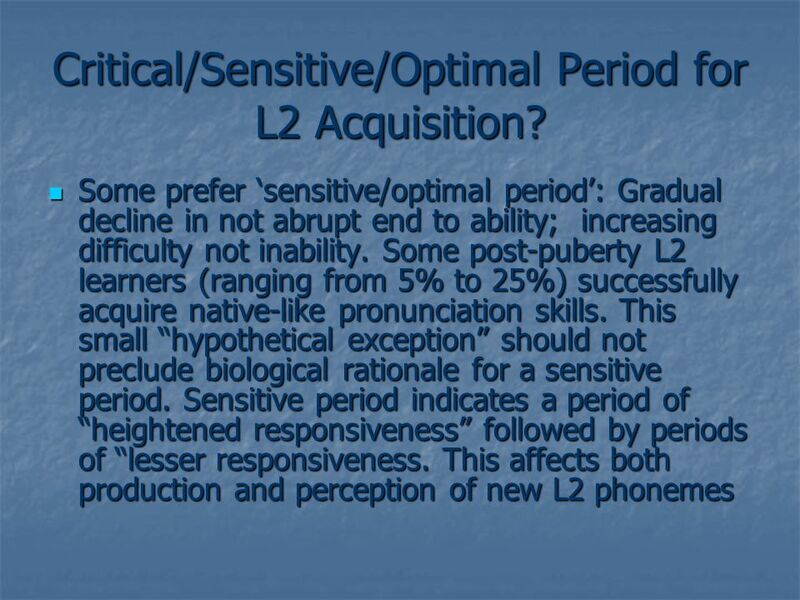 4 Critical/Sensitive/Optimal Period for L2 Acquisition? 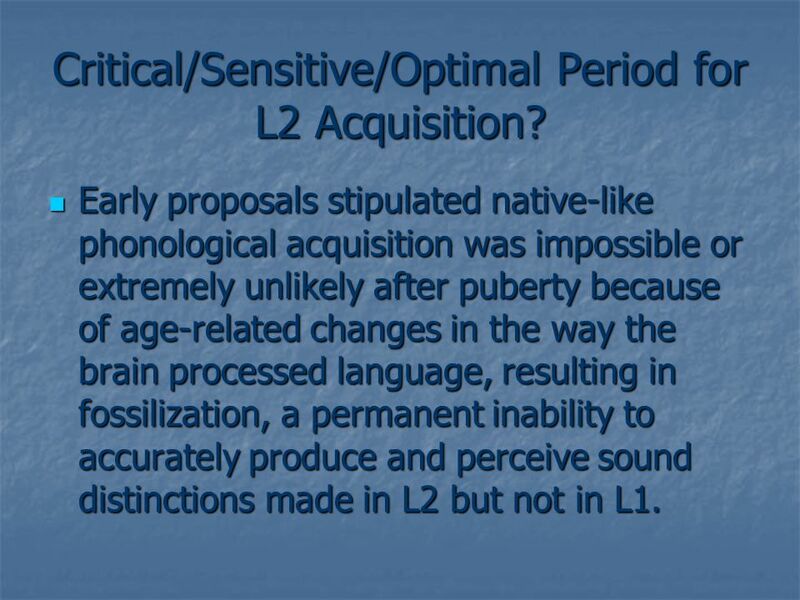 Early proposals stipulated native-like phonological acquisition was impossible or extremely unlikely after puberty because of age-related changes in the way the brain processed language, resulting in fossilization, a permanent inability to accurately produce and perceive sound distinctions made in L2 but not in L1. Early proposals stipulated native-like phonological acquisition was impossible or extremely unlikely after puberty because of age-related changes in the way the brain processed language, resulting in fossilization, a permanent inability to accurately produce and perceive sound distinctions made in L2 but not in L1. 6 Problems with Critical/Sensitive/Optimal Period Nature of the transfer or substitution process? To what extent is it triggered by age-related neurological or biological changes to the way the learner approaches the task of L2 acquisition? Are some L2 properties more/less likely to be transferred or substituted? Is there symmetry or asymmetry between production and perception errors? Nature of the transfer or substitution process? To what extent is it triggered by age-related neurological or biological changes to the way the learner approaches the task of L2 acquisition? Are some L2 properties more/less likely to be transferred or substituted? Is there symmetry or asymmetry between production and perception errors? 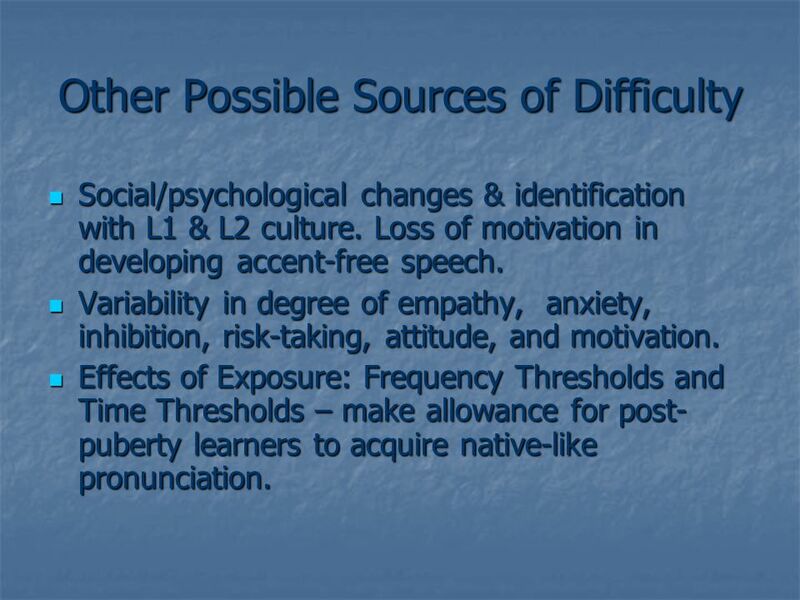 7 Other Possible Sources of Difficulty Social/psychological changes & identification with L1 & L2 culture. Loss of motivation in developing accent-free speech. Social/psychological changes & identification with L1 & L2 culture. Loss of motivation in developing accent-free speech. Variability in degree of empathy, anxiety, inhibition, risk-taking, attitude, and motivation. Variability in degree of empathy, anxiety, inhibition, risk-taking, attitude, and motivation. Effects of Exposure: Frequency Thresholds and Time Thresholds – make allowance for post- puberty learners to acquire native-like pronunciation. Effects of Exposure: Frequency Thresholds and Time Thresholds – make allowance for post- puberty learners to acquire native-like pronunciation. 8 Asymmetry between L2 Production & Perception Abilities? 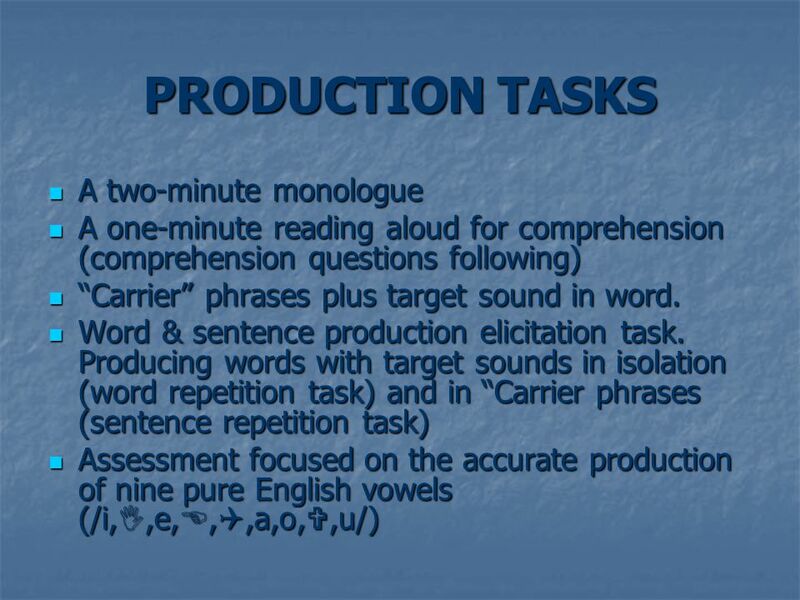 To what extent are L2 phonological difficulties conditioned by a lack of motor control or triggered by an inaccurate perception of L2 sounds (i.e. production errors have a perceptual basis? 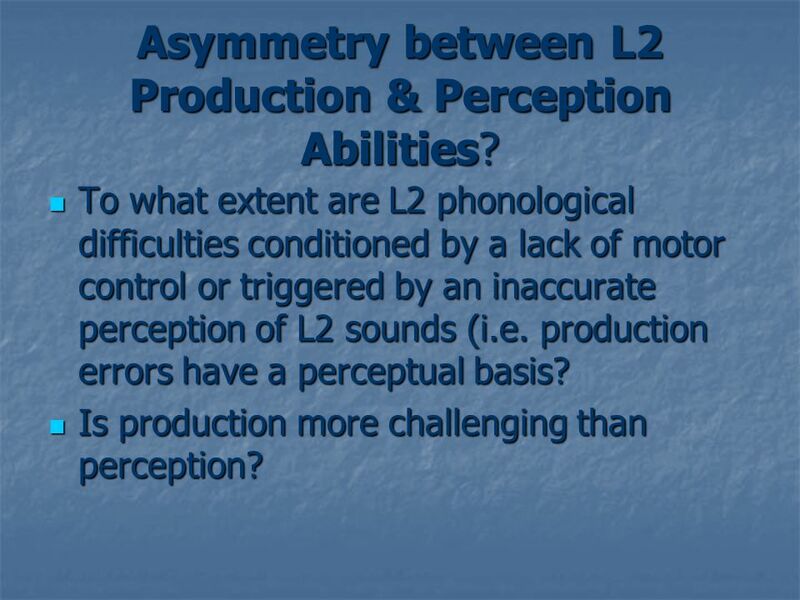 To what extent are L2 phonological difficulties conditioned by a lack of motor control or triggered by an inaccurate perception of L2 sounds (i.e. 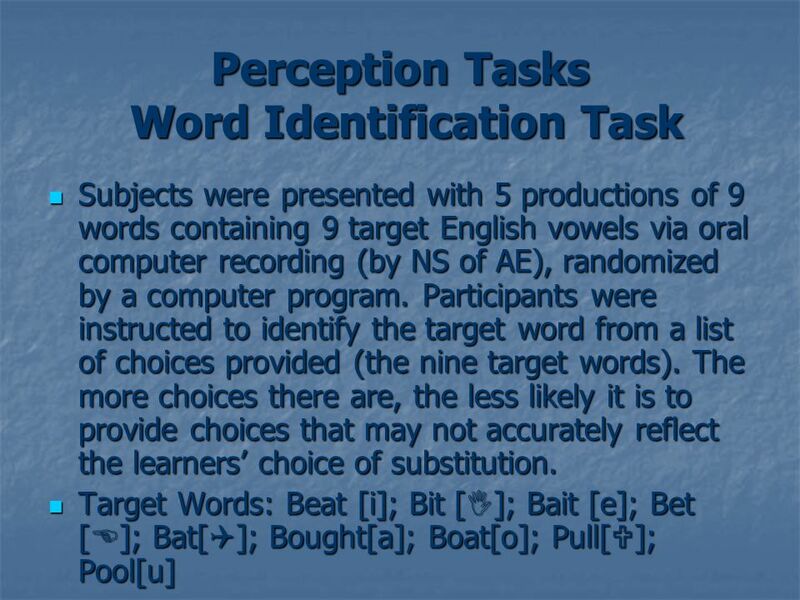 production errors have a perceptual basis? Is production more challenging than perception? Is production more challenging than perception? 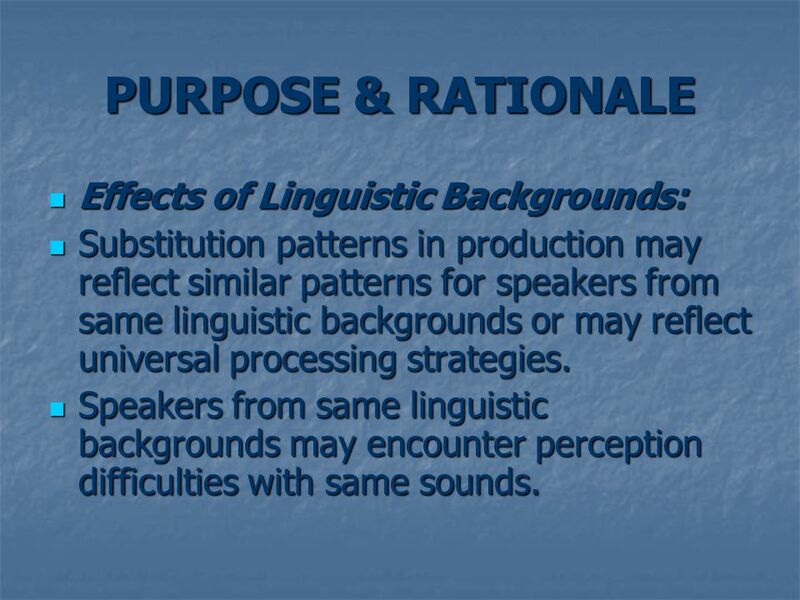 9 PURPOSE & RATIONALE Effects of Linguistic Backgrounds: Effects of Linguistic Backgrounds: Substitution patterns in production may reflect similar patterns for speakers from same linguistic backgrounds or may reflect universal processing strategies. Substitution patterns in production may reflect similar patterns for speakers from same linguistic backgrounds or may reflect universal processing strategies. Speakers from same linguistic backgrounds may encounter perception difficulties with same sounds. Speakers from same linguistic backgrounds may encounter perception difficulties with same sounds. 10 PURPOSE & RATIONALE Effects of Competence & Exposure: Degree of competence and exposure may influence the degree of accuracy in production. 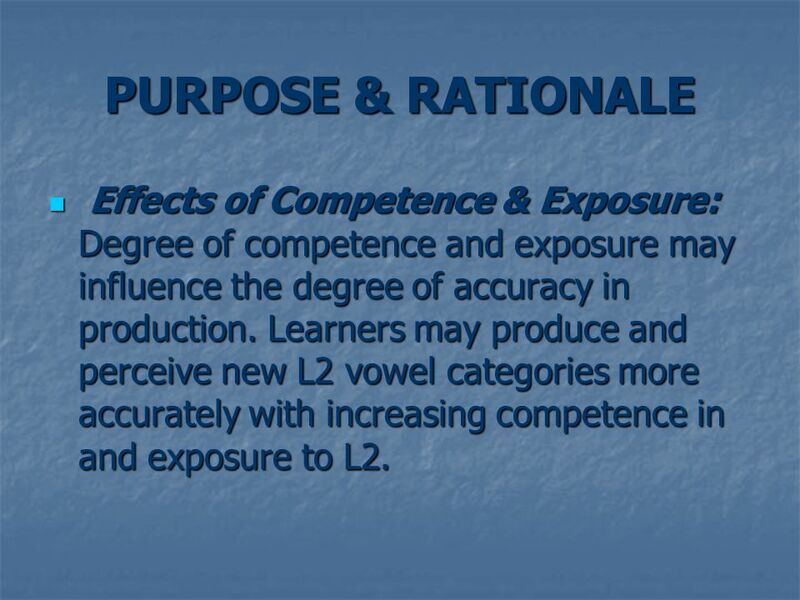 Learners may produce and perceive new L2 vowel categories more accurately with increasing competence in and exposure to L2. Effects of Competence & Exposure: Degree of competence and exposure may influence the degree of accuracy in production. Learners may produce and perceive new L2 vowel categories more accurately with increasing competence in and exposure to L2. 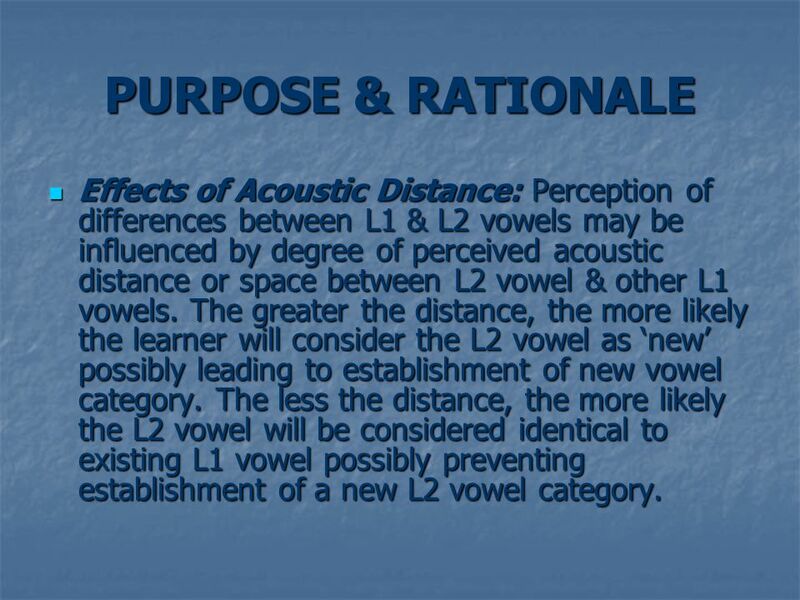 11 PURPOSE & RATIONALE Effects of Acoustic Distance: Perception of differences between L1 & L2 vowels may be influenced by degree of perceived acoustic distance or space between L2 vowel & other L1 vowels. 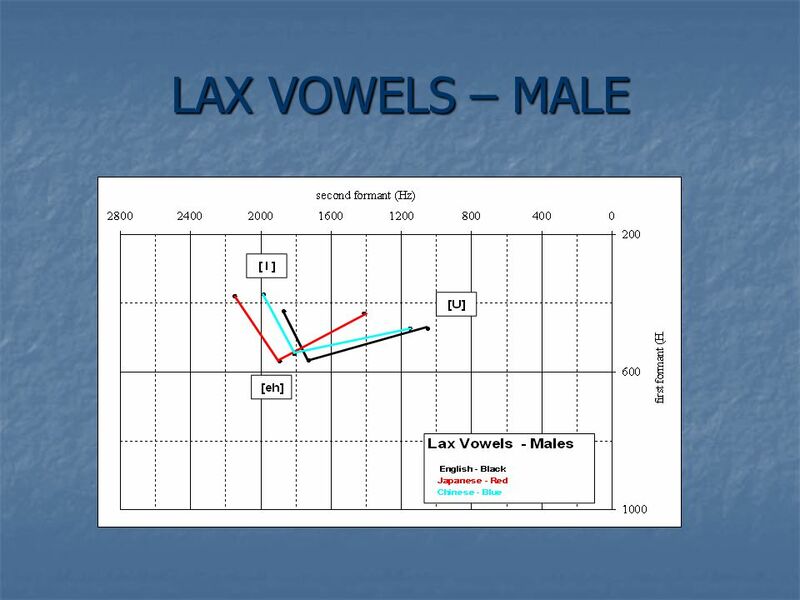 The greater the distance, the more likely the learner will consider the L2 vowel as ‘new’ possibly leading to establishment of new vowel category. 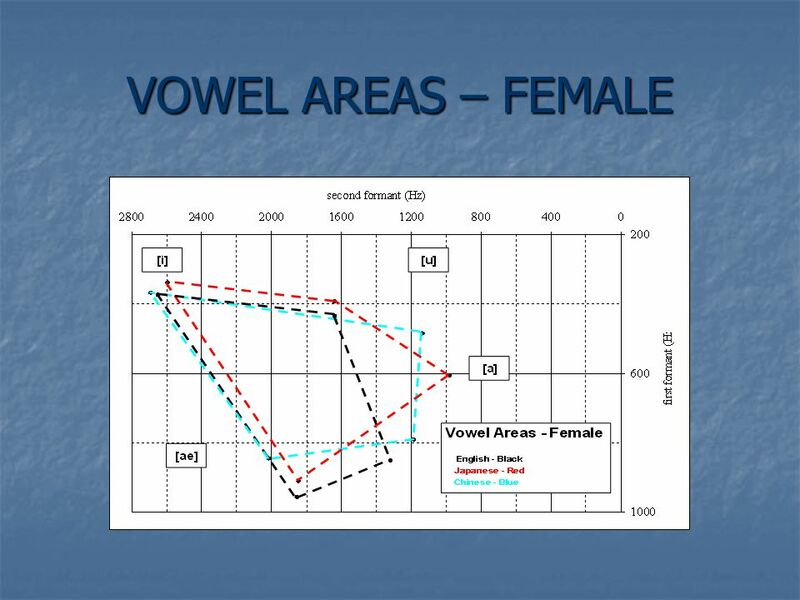 The less the distance, the more likely the L2 vowel will be considered identical to existing L1 vowel possibly preventing establishment of a new L2 vowel category. 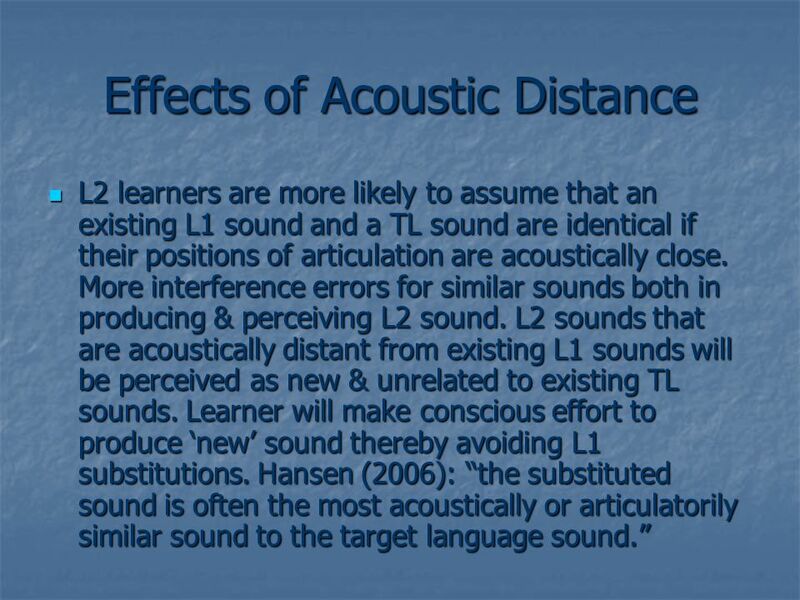 Effects of Acoustic Distance: Perception of differences between L1 & L2 vowels may be influenced by degree of perceived acoustic distance or space between L2 vowel & other L1 vowels. 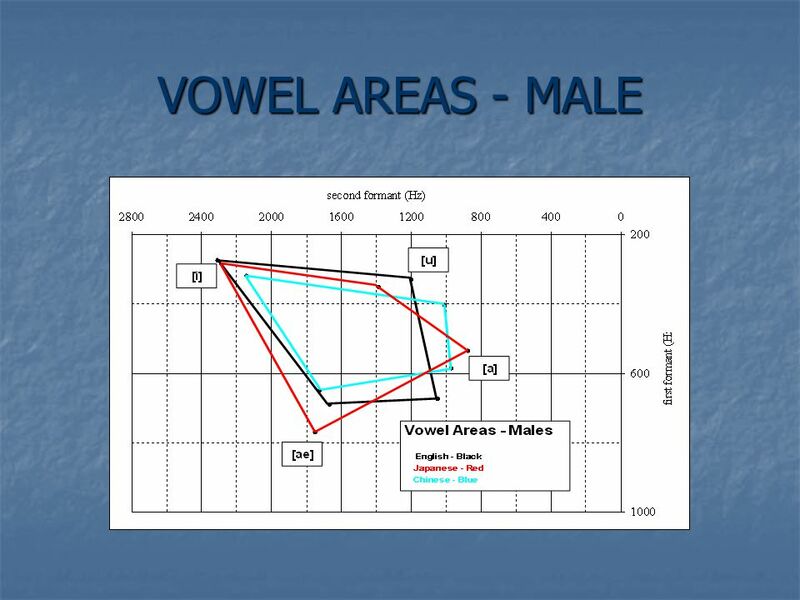 The greater the distance, the more likely the learner will consider the L2 vowel as ‘new’ possibly leading to establishment of new vowel category. 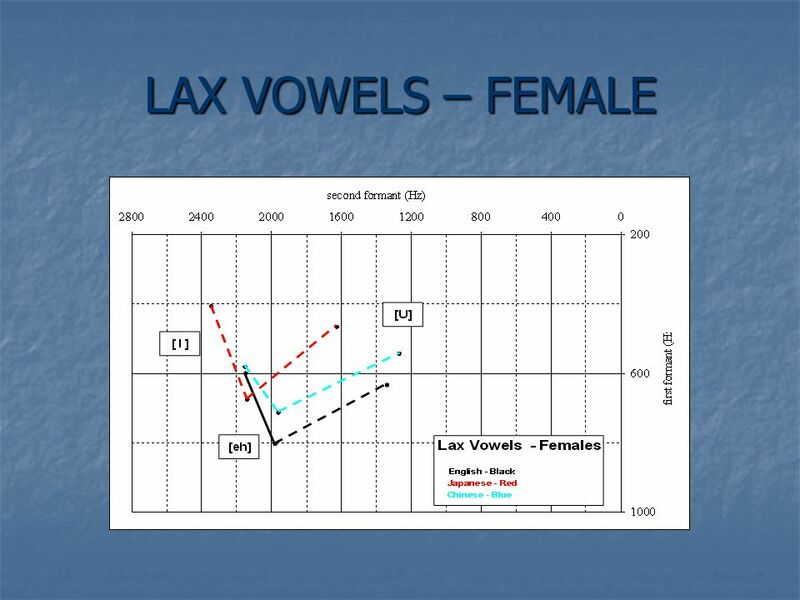 The less the distance, the more likely the L2 vowel will be considered identical to existing L1 vowel possibly preventing establishment of a new L2 vowel category. 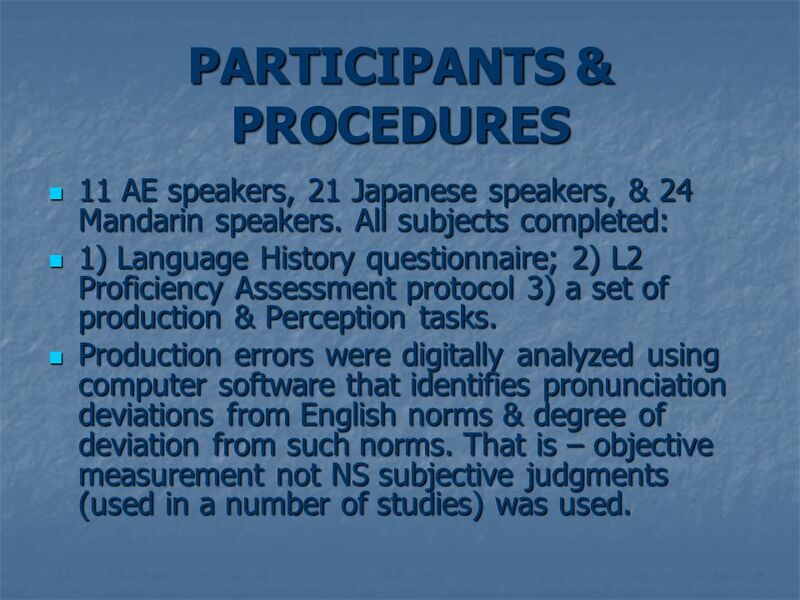 14 PARTICIPANTS & PROCEDURES 11 AE speakers, 21 Japanese speakers, & 24 Mandarin speakers. All subjects completed: 11 AE speakers, 21 Japanese speakers, & 24 Mandarin speakers. All subjects completed: 1) Language History questionnaire; 2) L2 Proficiency Assessment protocol 3) a set of production & Perception tasks. 1) Language History questionnaire; 2) L2 Proficiency Assessment protocol 3) a set of production & Perception tasks. 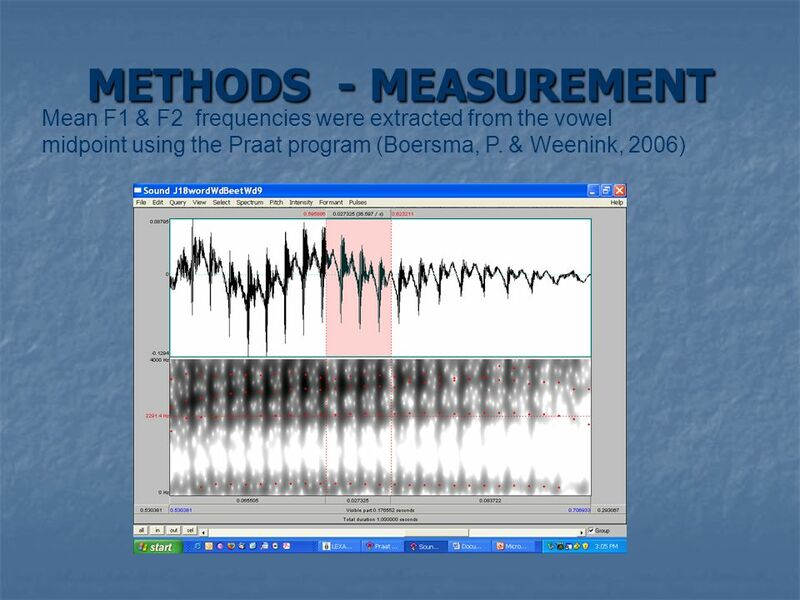 Production errors were digitally analyzed using computer software that identifies pronunciation deviations from English norms & degree of deviation from such norms. That is – objective measurement not NS subjective judgments (used in a number of studies) was used. 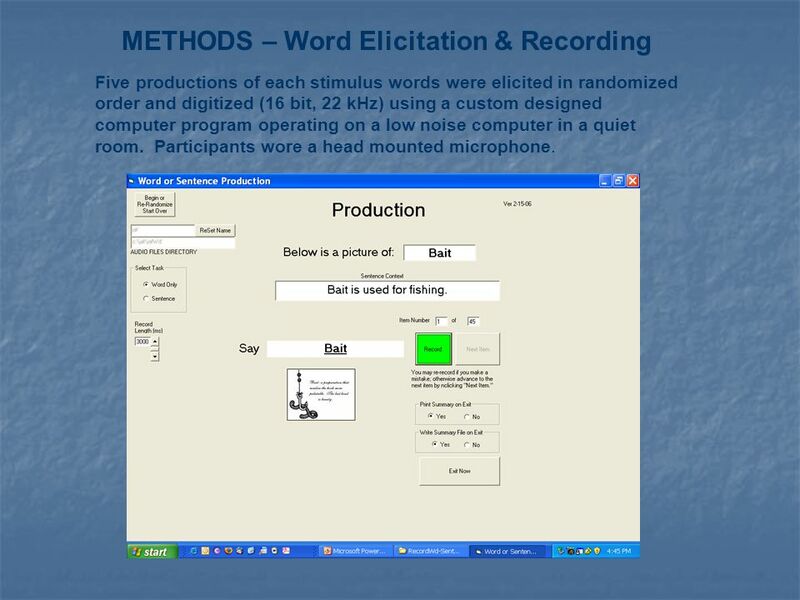 Production errors were digitally analyzed using computer software that identifies pronunciation deviations from English norms & degree of deviation from such norms. That is – objective measurement not NS subjective judgments (used in a number of studies) was used. 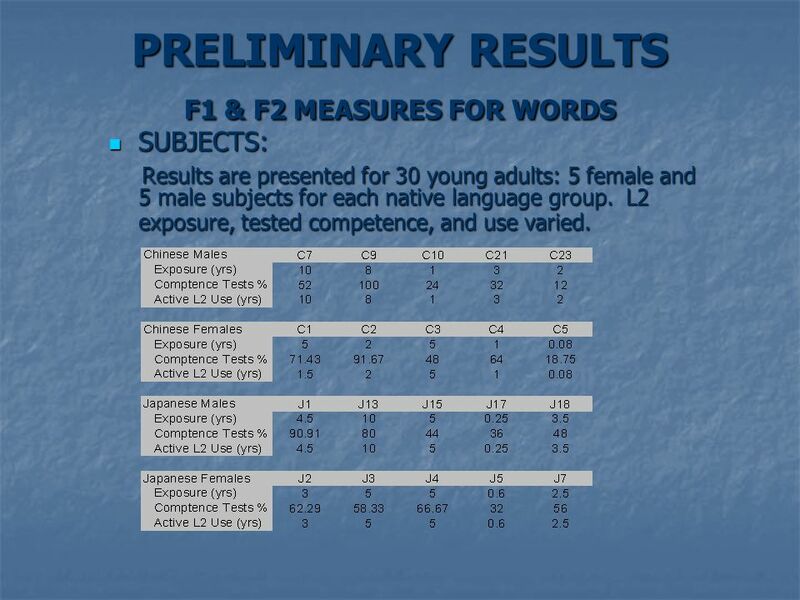 16 PRELIMINARY RESULTS F1 & F2 MEASURES FOR WORDS SUBJECTS: SUBJECTS: Results are presented for 30 young adults: 5 female and 5 male subjects for each native language group. L2 exposure, tested competence, and use varied. Results are presented for 30 young adults: 5 female and 5 male subjects for each native language group. L2 exposure, tested competence, and use varied. 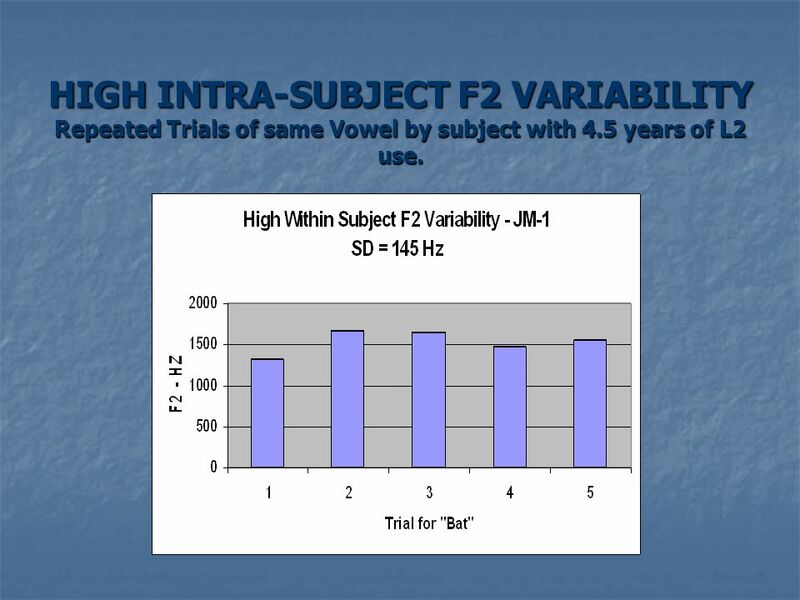 25 HIGH INTRA-SUBJECT F2 VARIABILITY Repeated Trials of same Vowel by subject with 4.5 years of L2 use. 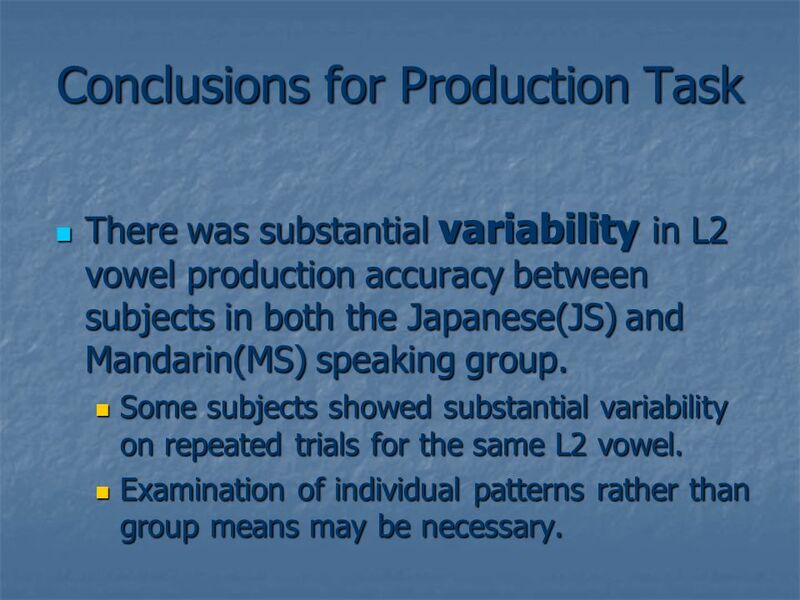 26 Conclusions for Production Task There was substantial variability in L2 vowel production accuracy between subjects in both the Japanese(JS) and Mandarin(MS) speaking group. There was substantial variability in L2 vowel production accuracy between subjects in both the Japanese(JS) and Mandarin(MS) speaking group. Some subjects showed substantial variability on repeated trials for the same L2 vowel. Some subjects showed substantial variability on repeated trials for the same L2 vowel. Examination of individual patterns rather than group means may be necessary. Examination of individual patterns rather than group means may be necessary. 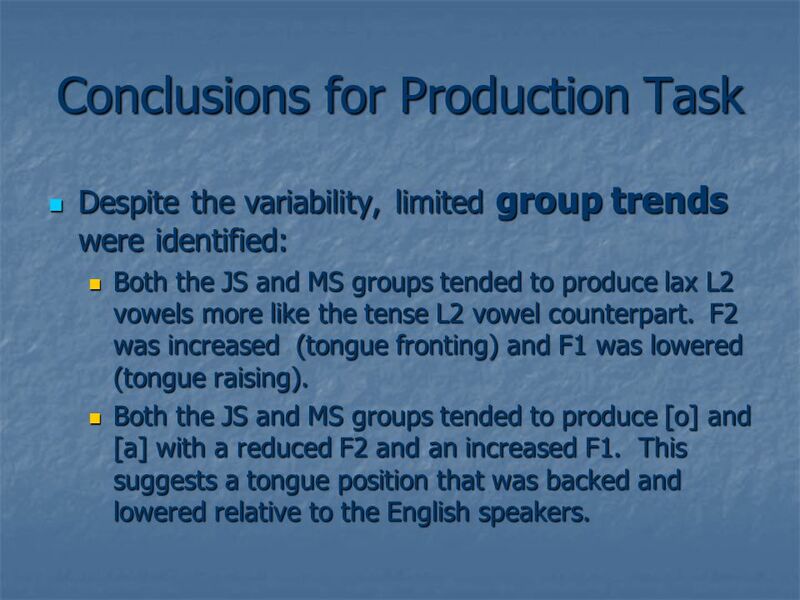 27 Conclusions for Production Task Despite the variability, limited group trends were identified: Despite the variability, limited group trends were identified: Both the JS and MS groups tended to produce lax L2 vowels more like the tense L2 vowel counterpart. F2 was increased (tongue fronting) and F1 was lowered (tongue raising). Both the JS and MS groups tended to produce lax L2 vowels more like the tense L2 vowel counterpart. F2 was increased (tongue fronting) and F1 was lowered (tongue raising). 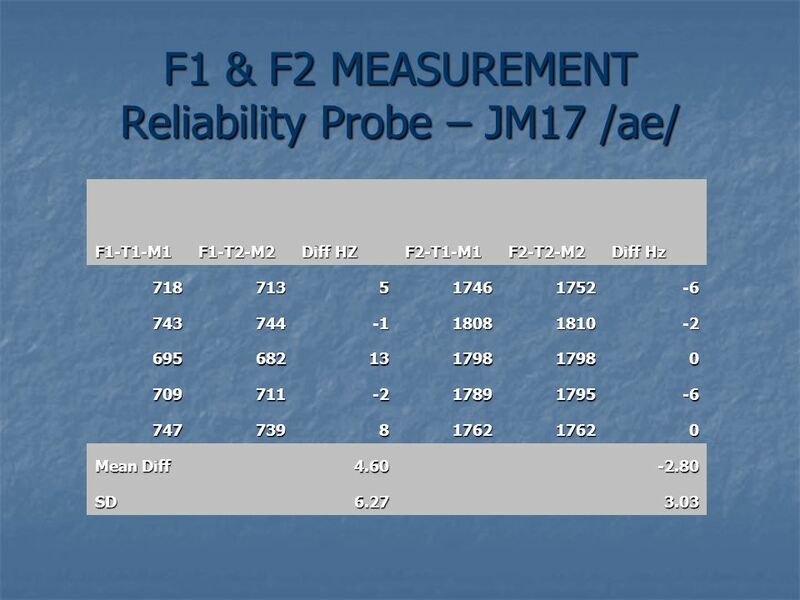 Both the JS and MS groups tended to produce [o] and [a] with a reduced F2 and an increased F1. This suggests a tongue position that was backed and lowered relative to the English speakers. Both the JS and MS groups tended to produce [o] and [a] with a reduced F2 and an increased F1. This suggests a tongue position that was backed and lowered relative to the English speakers. 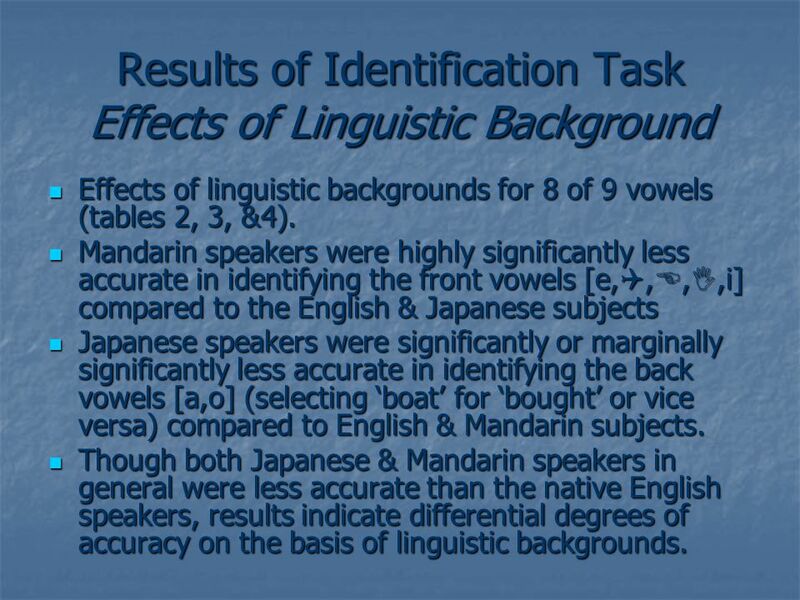 29 Results of Identification Task Effects of Linguistic Background Effects of linguistic backgrounds for 8 of 9 vowels (tables 2, 3, &4). Effects of linguistic backgrounds for 8 of 9 vowels (tables 2, 3, &4). Mandarin speakers were highly significantly less accurate in identifying the front vowels [e, , , ,i] compared to the English & Japanese subjects Mandarin speakers were highly significantly less accurate in identifying the front vowels [e, , , ,i] compared to the English & Japanese subjects Japanese speakers were significantly or marginally significantly less accurate in identifying the back vowels [a,o] (selecting ‘boat’ for ‘bought’ or vice versa) compared to English & Mandarin subjects. 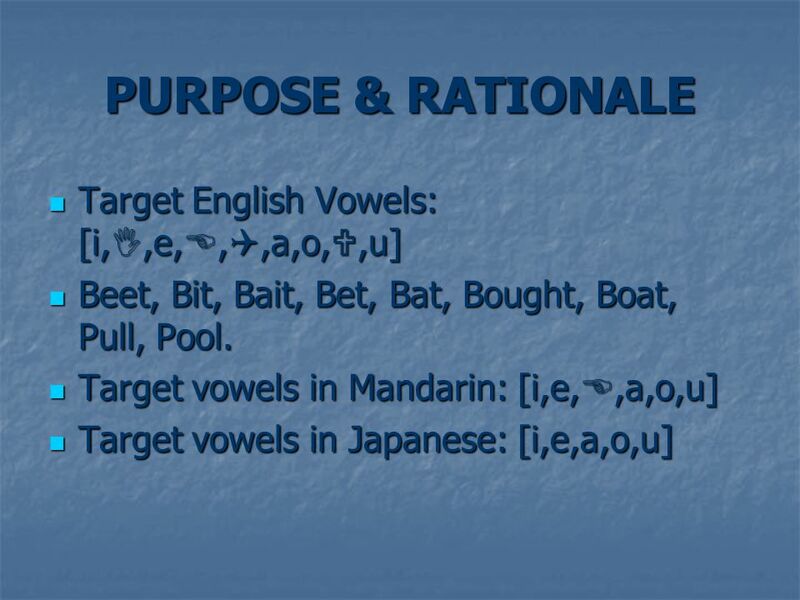 Japanese speakers were significantly or marginally significantly less accurate in identifying the back vowels [a,o] (selecting ‘boat’ for ‘bought’ or vice versa) compared to English & Mandarin subjects. Though both Japanese & Mandarin speakers in general were less accurate than the native English speakers, results indicate differential degrees of accuracy on the basis of linguistic backgrounds. Though both Japanese & Mandarin speakers in general were less accurate than the native English speakers, results indicate differential degrees of accuracy on the basis of linguistic backgrounds. 30 Effects of Acoustic Distance Partial confirmation of effects. Japanese & Mandarin subjects were highly significantly less accurate in perceiving [  ] compared to English subjects Partial confirmation of effects. Japanese & Mandarin subjects were highly significantly less accurate in perceiving [  ] compared to English subjects Mandarin subjects additionally were highly significantly less accurate in perceiving [i] compared to English subjects. 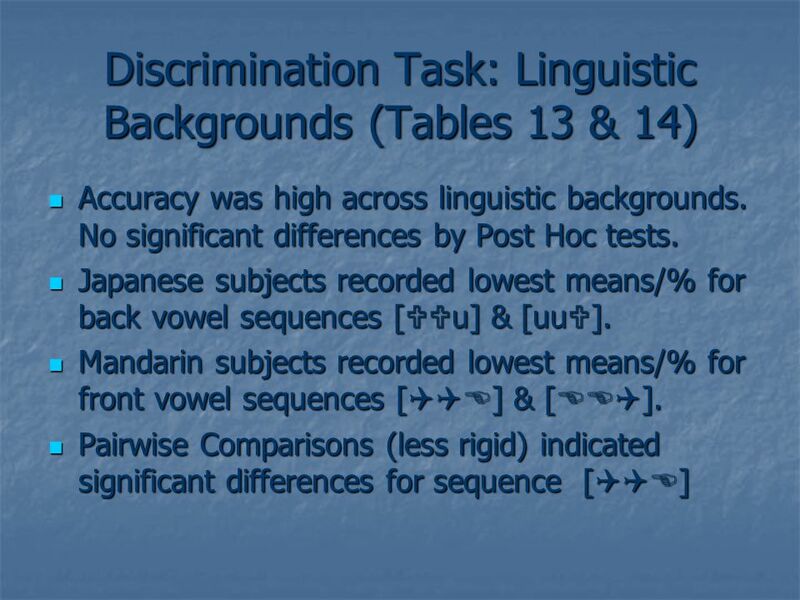 Mandarin subjects additionally were highly significantly less accurate in perceiving [i] compared to English subjects. There were no significant mean effects in perceiving [  ] in spite of its acoustic proximity to [u] & absence in Japanese & Mandarin. There were no significant mean effects in perceiving [  ] in spite of its acoustic proximity to [u] & absence in Japanese & Mandarin. Mandarin subjects were highly significantly less accurate in perceiving [u] compared to Japanese & English subjects. Mandarin subjects were highly significantly less accurate in perceiving [u] compared to Japanese & English subjects. 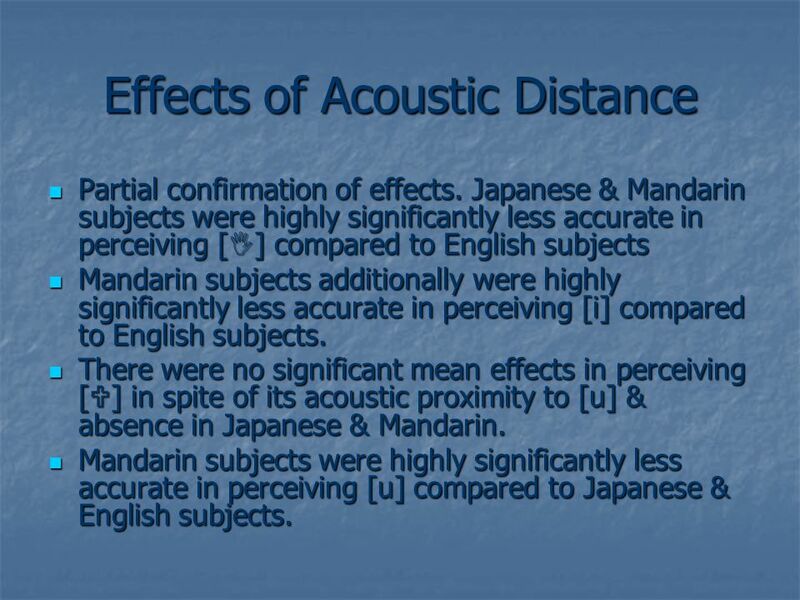 31 Effects of Acoustic Distance [ ,  ] Mandarin subjects experienced difficulty & were significantly less accurate in perceiving difference between [  ] (absent in Mandarin) and [  ] (present in Mandarin) compared to English & Japanese subjects since both vowels are acoustically close. 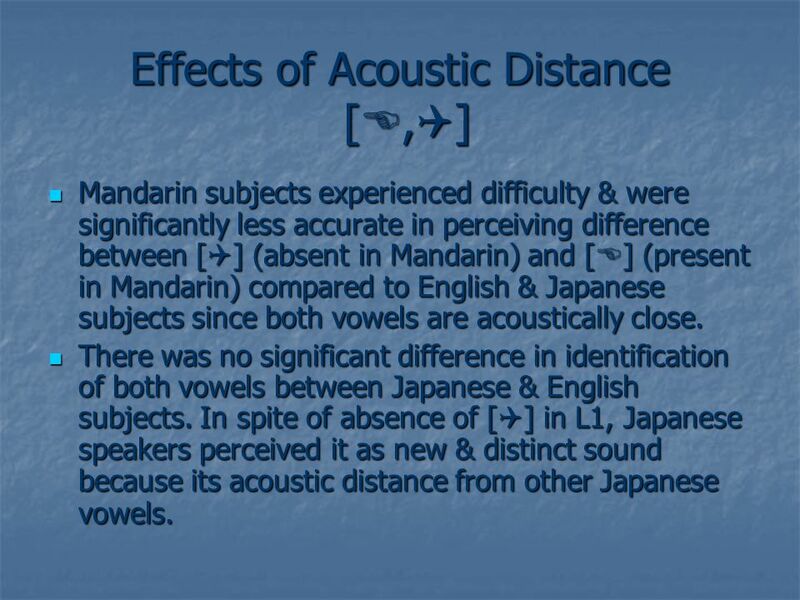 Mandarin subjects experienced difficulty & were significantly less accurate in perceiving difference between [  ] (absent in Mandarin) and [  ] (present in Mandarin) compared to English & Japanese subjects since both vowels are acoustically close. There was no significant difference in identification of both vowels between Japanese & English subjects. In spite of absence of [  ] in L1, Japanese speakers perceived it as new & distinct sound because its acoustic distance from other Japanese vowels. There was no significant difference in identification of both vowels between Japanese & English subjects. In spite of absence of [  ] in L1, Japanese speakers perceived it as new & distinct sound because its acoustic distance from other Japanese vowels. 32 [a,o] Japanese but not Mandarin subjects were significantly less accurate in perceiving difference between [a] and [o] compared to other groups in spite of presence of both vowels in Japanese and Mandarin & acoustic distance between both vowels. 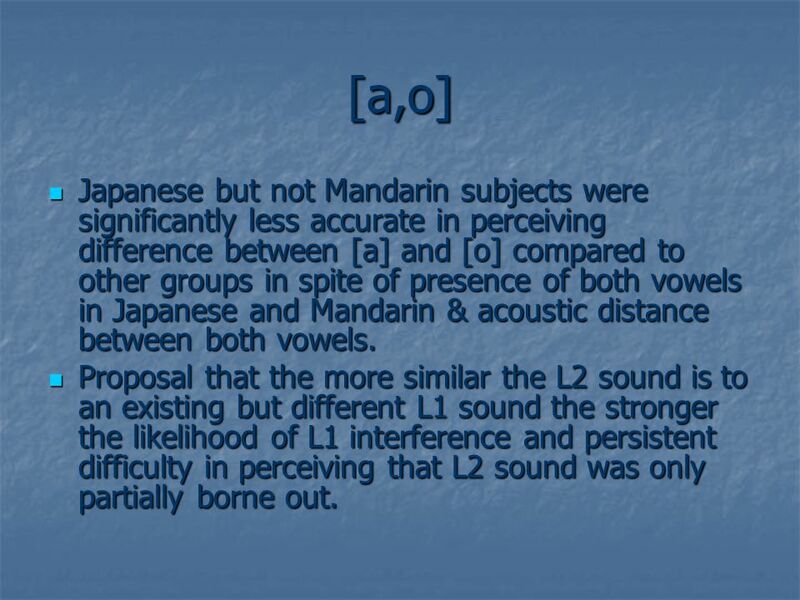 Japanese but not Mandarin subjects were significantly less accurate in perceiving difference between [a] and [o] compared to other groups in spite of presence of both vowels in Japanese and Mandarin & acoustic distance between both vowels. Proposal that the more similar the L2 sound is to an existing but different L1 sound the stronger the likelihood of L1 interference and persistent difficulty in perceiving that L2 sound was only partially borne out. Proposal that the more similar the L2 sound is to an existing but different L1 sound the stronger the likelihood of L1 interference and persistent difficulty in perceiving that L2 sound was only partially borne out. 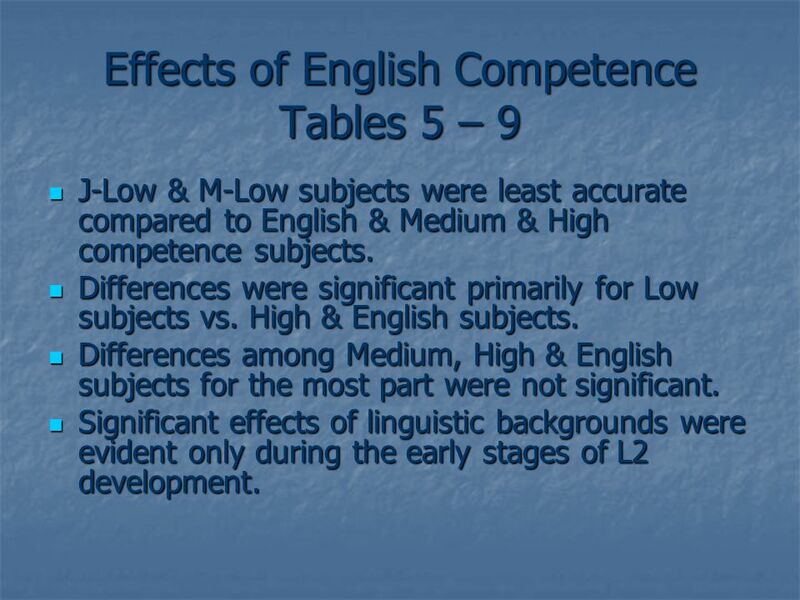 33 Effects of English Competence Tables 5 – 9 J-Low & M-Low subjects were least accurate compared to English & Medium & High competence subjects. J-Low & M-Low subjects were least accurate compared to English & Medium & High competence subjects. 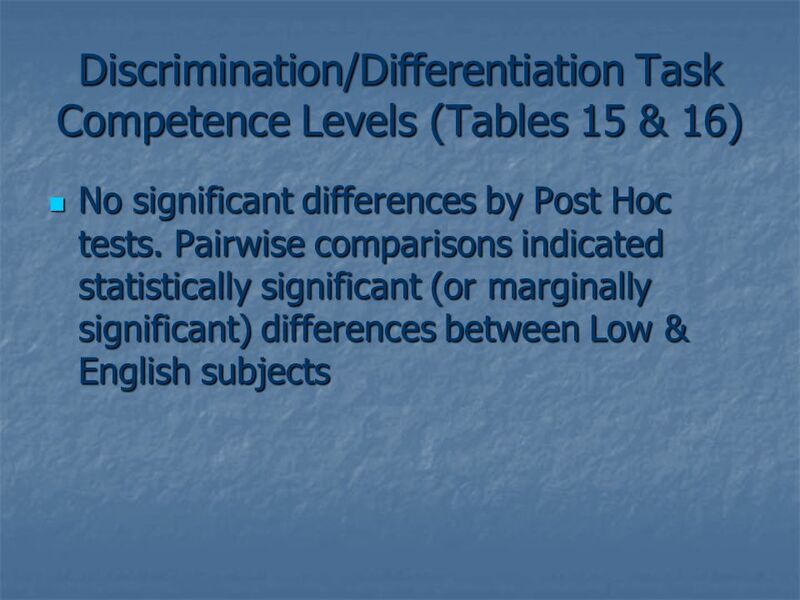 Differences were significant primarily for Low subjects vs. High & English subjects. Differences were significant primarily for Low subjects vs. High & English subjects. Differences among Medium, High & English subjects for the most part were not significant. Differences among Medium, High & English subjects for the most part were not significant. 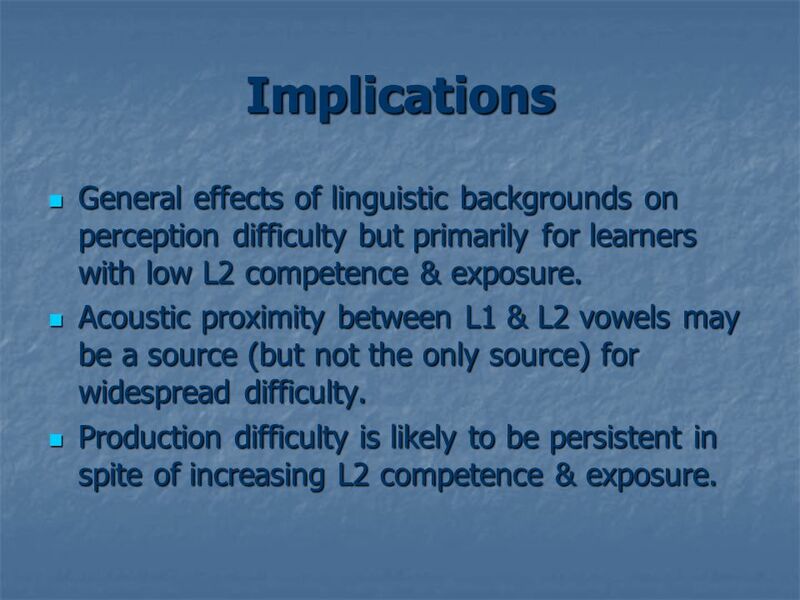 Significant effects of linguistic backgrounds were evident only during the early stages of L2 development. Significant effects of linguistic backgrounds were evident only during the early stages of L2 development. 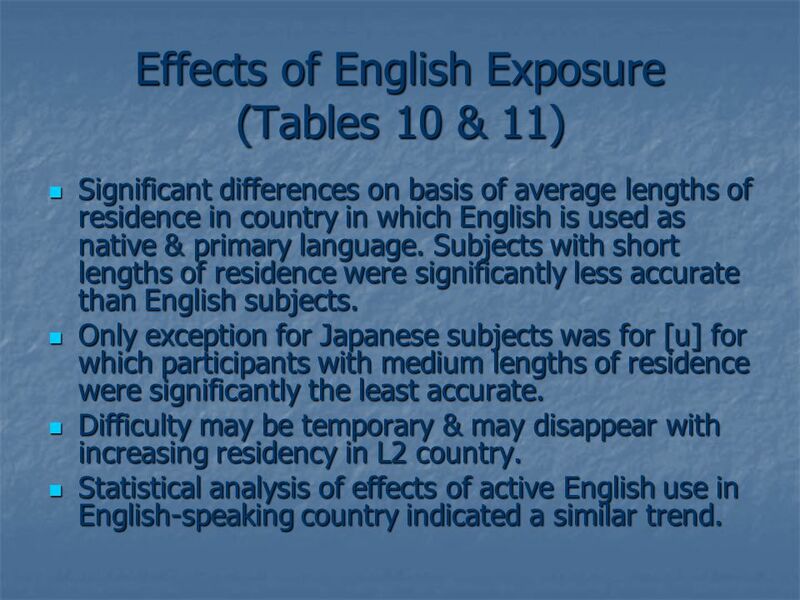 34 Effects of English Exposure (Tables 10 & 11) Significant differences on basis of average lengths of residence in country in which English is used as native & primary language. Subjects with short lengths of residence were significantly less accurate than English subjects. Significant differences on basis of average lengths of residence in country in which English is used as native & primary language. Subjects with short lengths of residence were significantly less accurate than English subjects. Only exception for Japanese subjects was for [u] for which participants with medium lengths of residence were significantly the least accurate. Only exception for Japanese subjects was for [u] for which participants with medium lengths of residence were significantly the least accurate. Difficulty may be temporary & may disappear with increasing residency in L2 country. Difficulty may be temporary & may disappear with increasing residency in L2 country. Statistical analysis of effects of active English use in English-speaking country indicated a similar trend. Statistical analysis of effects of active English use in English-speaking country indicated a similar trend. 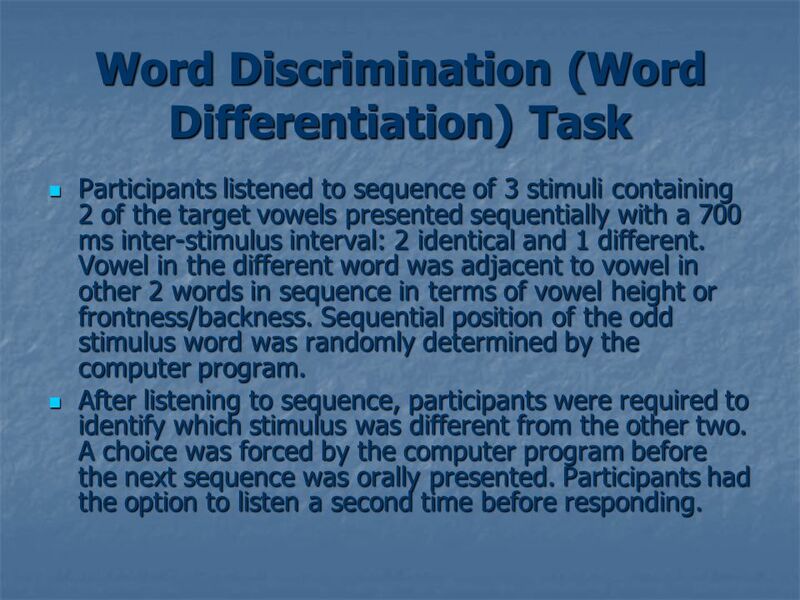 36 Word Discrimination (Word Differentiation) Task Participants listened to sequence of 3 stimuli containing 2 of the target vowels presented sequentially with a 700 ms inter-stimulus interval: 2 identical and 1 different. Vowel in the different word was adjacent to vowel in other 2 words in sequence in terms of vowel height or frontness/backness. 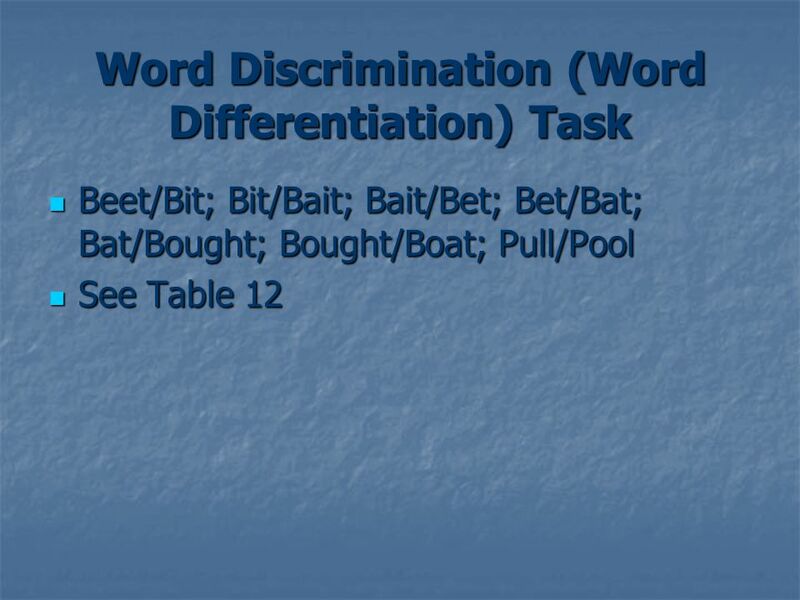 Sequential position of the odd stimulus word was randomly determined by the computer program. Participants listened to sequence of 3 stimuli containing 2 of the target vowels presented sequentially with a 700 ms inter-stimulus interval: 2 identical and 1 different. Vowel in the different word was adjacent to vowel in other 2 words in sequence in terms of vowel height or frontness/backness. Sequential position of the odd stimulus word was randomly determined by the computer program. After listening to sequence, participants were required to identify which stimulus was different from the other two. A choice was forced by the computer program before the next sequence was orally presented. Participants had the option to listen a second time before responding. After listening to sequence, participants were required to identify which stimulus was different from the other two. A choice was forced by the computer program before the next sequence was orally presented. Participants had the option to listen a second time before responding. 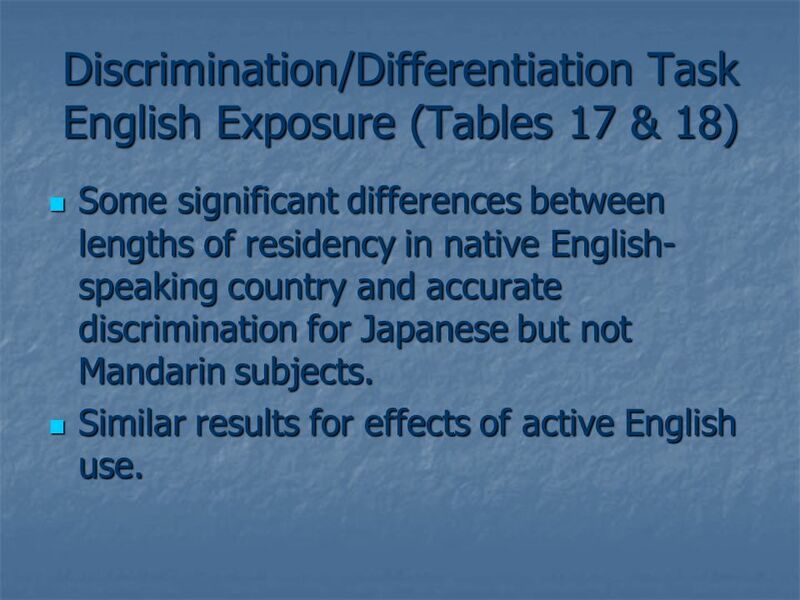 39 Discrimination/Differentiation Task English Exposure (Tables 17 & 18) Some significant differences between lengths of residency in native English- speaking country and accurate discrimination for Japanese but not Mandarin subjects. Some significant differences between lengths of residency in native English- speaking country and accurate discrimination for Japanese but not Mandarin subjects. Similar results for effects of active English use. Similar results for effects of active English use. 40 Implications General effects of linguistic backgrounds on perception difficulty but primarily for learners with low L2 competence & exposure. General effects of linguistic backgrounds on perception difficulty but primarily for learners with low L2 competence & exposure. Acoustic proximity between L1 & L2 vowels may be a source (but not the only source) for widespread difficulty. Acoustic proximity between L1 & L2 vowels may be a source (but not the only source) for widespread difficulty. Production difficulty is likely to be persistent in spite of increasing L2 competence & exposure. Production difficulty is likely to be persistent in spite of increasing L2 competence & exposure. 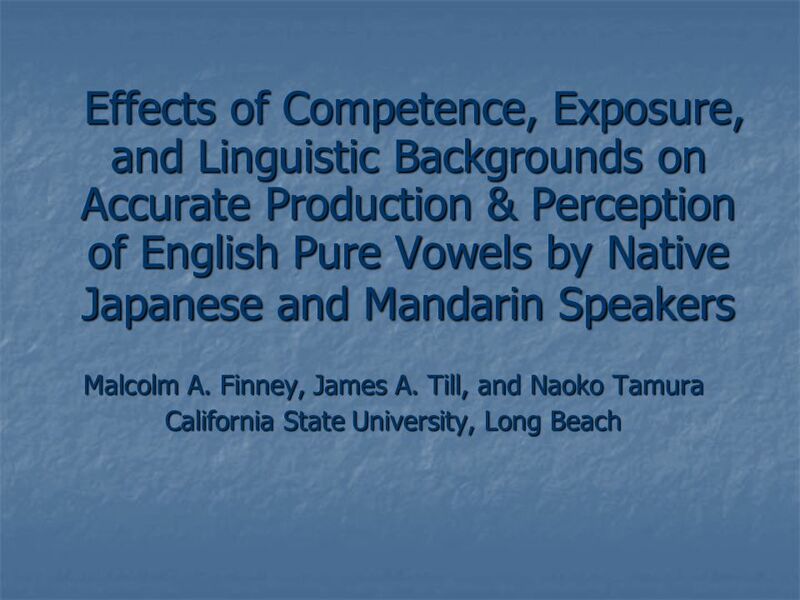 Download ppt "Effects of Competence, Exposure, and Linguistic Backgrounds on Accurate Production & Perception of English Pure Vowels by Native Japanese and Mandarin." 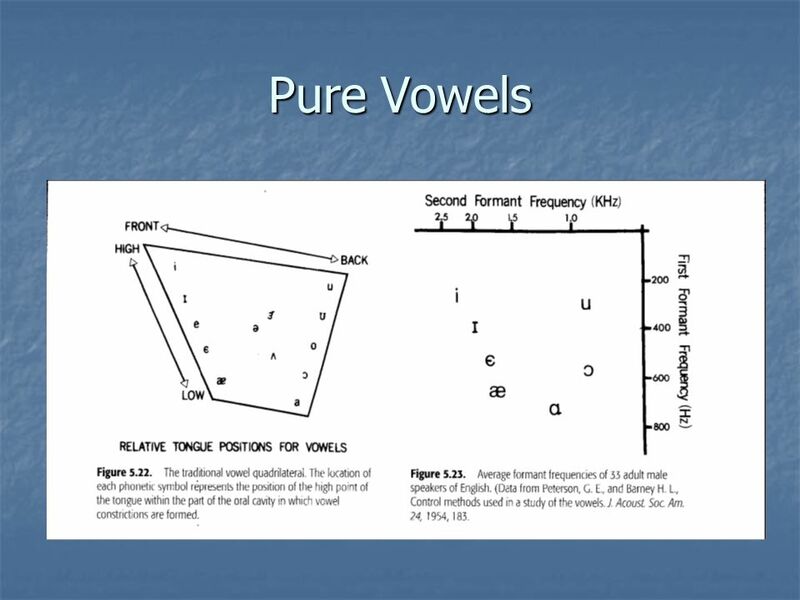 Effects of Competence, Exposure, and Linguistic Backgrounds on Accurate Production of English Pure Vowels by Native Japanese and Mandarin Speakers Malcolm. Ling 240: Language and Mind Acquisition of Phonology. “Speech and the Hearing-Impaired Child: Theory and Practice” Ch. 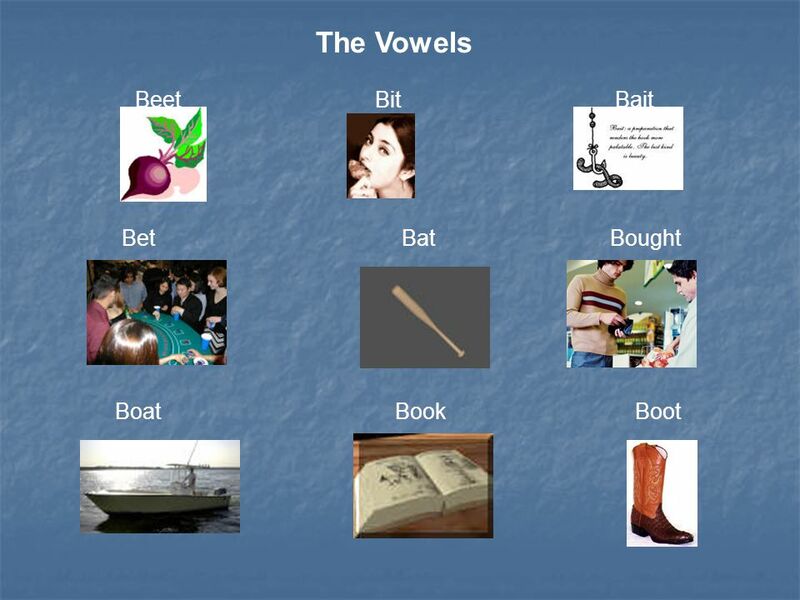 13 Vowels and Diphthongs –Vowels are formed when sound produced at the glottal source. Sentence Durations and Accentedness Judgments ABSTRACT Talkers in a second language can frequently be identified as speaking with a foreign accent. It. Vocal Emotion Recognition with Cochlear Implants Xin Luo, Qian-Jie Fu, John J. Galvin III Presentation By Archie Archibong. Introducing SLA of phonology research: Major fields of research.